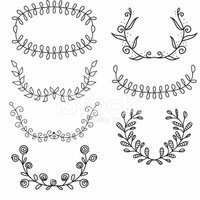 Set of different floral hand drawn vector victory laurel. Hand drawn floral wallpaper with set of different flowers. Blank tropical signs in 4 different colors.